The ongoing transformation of the skyline in Johor’s capital city has seen the emergence of many residential, commercial and retail developments, especially within the city centre. Despite the rapid influx of concrete and steel, and population growth, many feel the city centre and the areas around it still lack the necessary vibrancy and pulse required to achieve its desired goal of being a global city. Among the voids that need to be addressed are innovative developments that offer a one-stop destination to blend business and leisure elements at a single address. Danga2Iskandar Waterfront City Bhd (IWCITY), which is involved in a portion of the mammoth 4,000-acre Iskandar Waterfront development within Flagship A, has a vision to reinvent JB, not just by reshaping its landscape but also via the beautification of waterfronts along the Johor Strait. No small feat, Iskandar Waterfront City in JB will stretch along 25km of scenic waterfront land facing the Johor Strait and it will be home to iconic buildings, shopping malls and a number of major tourist attractions when fully completed over the next two decades. The endeavour promises to result in a feast for the eyes, but with style must come substance, says Eva Ng, general manager (marketing) of IWCITY. 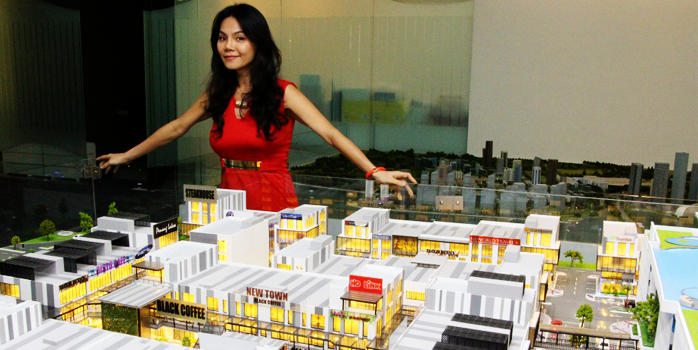 She is also in charge of Iskandar Waterfront’s eastern corridor projects. Among the key projects taking shape in the locale is the highly anticipated Botanika, a residential development that will play host to luxurious, but affordable, waterfront villas and condos. In addition to this, there will be private owned projects taking shape in the area that will provide a synergic built environment and strong lifestyle appeal. This includes Danga Boulevard, a mixed development being undertaken by the privately-owned Naga Berkat Sdn Bhd which will adopt vibrant urban centre concept found in many popular integrated projects in Kuala Lumpur and Singapore. Eva Ng considers it her key role to ensure that the lifestyle appeal of her projects is just as compelling as the investment opportunities they will offer. Real Spaces speaks to this energetic and passionate general manager about how Danga Boulevard will set the pace for developments to come, and contribute in the mission to make it a premier lifestyle destination. Tell us more about the latest Danga Boulevard mixed integrated development and how it fits into the Iskandar Waterfront City ideology. The developer wanted to create a revolutionary business address on 11 acres, comprising a vibrant, interactive and pleasant space destined to be the focal point for upwardly mobile individuals. It is designed to be a destination where work and leisure converge under a single roof. Danga Boulevard is an innovative all-in-one development comprising retail outlets, offices and SoVos (Small-office Versatileoffices) overlooking lush tropical greenery, waterways and fountains to form a relaxing place to work, shop and dine within a safe, comfortable and friendly environment. What is the key lifestyle proposition being offered and how will this contribute to and enhance the existing surrounding landscape? The lifestyle propositions are, in fact, many. Danga Boulevard happens to be the first integrated project in Johor to have a spacious central courtyard, allowing operators of lifestyle-oriented products and services to fully utilise the courtyard space. This concept is similar to those found in KL, in places such as The Curve, Publika as well as Encorp Strand. This is something JB still lacks and this project will bring something unique and fresh to the local landscape. The developer believes that Danga Boulevard will stand apart in Johor because it will encompass a one-stop resource and discovery centre for all travellers, a key factor when you consider the huge amount of Singaporeans flooding into JB to spend their weekends. It will also host an international concourse for locals and travellers alike, those seeking the latest fashions and trends, while the centre courtyard acts as a festive walk, hosting concerts, events and even launches. There will also be leasable open spaces for street bazaars and flea markets as well as a myriad of speciality stores and F&B outlets. All-in-all, the central courtyard will be landscaped with lush greenery and waterways, making it even more unique and eye-catching. Danga Boulevard has also employed the services of a landscape consultant from Singapore to ensure the visual elements and the ambience will be on par with those in successful developments in KL and Singapore. What are some of the major highlights of the retail units available and what are the lifestyle enhancement features buyers can expect? There are a total of 86 retail shop offices ranging from three- to five-storeys. The three-storey units come in dimensions of 24ft by 65ft and 28ft by 65ft, four-storey units with 24ft by 65ft to 32ft by 65ft, and the five-storey units with 38ft by 65ft. These units are pegged from RM1.6 million onwards. These are an enhancement to the traditional concept, as they come with a dedicated grand entrance and spacious driveways. It will boast dual frontage, with widely spaced corridors to benefit cafes and al-fresco eateries. Additionally, there will be ample of parking bays for visitors with up to 500 bays as well as 24-hour security patrol and CCTV surveillance. The project will also come ready with high speed broadband. In the near future, the project will also launch SoVo units. From an investor’s perspective, how will the location of Danga Boulevard benefit rental returns? Due to its strategic location along Jalan Tampoi, Danga Boulevard is conveniently linked to the JB City Centre and to Singapore via the CIQ. Meanwhile, the project is also 2km from the Pasir Gudang Highway, 3km from Jalan Skudai and 5.5km to the North-South Highway. Located in the matured Tampoi suburb close to downtown JB, the area is surrounded by light industry factories and ample amenities. This includes convenient access to shopping and leisure centres, educational institutes, medical centres, theme parks and the airport. There are plans to house a university and international standard hospital nearby, while the new bus terminal is located just minutes away. With these elements in place, the development is able to attract a strong catchment of 300,000 people from the surrounding vicinity. This number increases exponentially during the weekends because of the high visitation traffic from Singapore. The development is likely to create strong tenancy demand with the unique features, concept and experience it will bring to the Johor landscape. It will be a genuine lifestyle destination in Johor Bahru, and that in itself is a very compelling selling point.